A supplement with an extract from a mushroom that grows in forests and parks around the world may increase both muscle strength and endurance. Scientists from Taiwan write this in the International Journal of Medical Sciences. 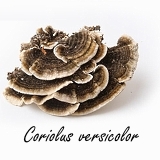 That mushroom is called Coriolus versicolor in Latin, but you probably know it as a Turkey Tail. For 28 days the researchers gave the mice a large dose of Coriolus versicolor every day. You can see the dosages in the figure below. Here you can read how you can calculate the human equivalents of the doses used. The researchers used a supplement with mycelium extract from Coriolus versicolor. It was produced by GeneFerm Biotechnology, and consisted for 27.5 percent of the polysaccharide krestin. GeneFerm Biotechnology did not sponsor the study. The researchers were paid by the Taiwanese government. After the supplementation period, the researchers determined how much strength the mice could develop with their fore paws. They also looked at how long the animals could keep swimming. Coriolus veriscolor supplementation increased both the strength and endurance of the animals. Remarkably, the lowest dose was just as effective as the higher doses. It is therefore possible that the optimum dose of Coriolus veriscolor is below the range that the researchers tested in this animal study, we suspect. "In addition, we found that Coriolus versicolor mycelia extract has anti-fatigue activity by decreasing serum lactate, ammonia and creatine kinase and levels concentration at post-exercise, thereby elevating exercise performance in mice", write the researchers. "These results showed that Coriolus versicolor mycelia extract has great potential in anti-fatigue activity", the Taiwanese summarize their findings. Oyster mushrooms – Latin name: Pleurotus ostreatus – contain sugar chains that activate the immune system, and help to prevent flu and colds. A capsule containing 500 mg Hericium erinaceus should be capable of improving an athlete's endurance capacity. Nutritionists at the University of California in Los Angeles discovered this when they did experiments with men and women aged between 50 and 75.